BOPREINA Stainless Steel Mens Tie Bar Clip and Cufflinks Set with Gift Box, Exquisite GQ Classic Regular Tie Clip, Simple Graceful Design,Modern and Minimalism Style, Sliver Color. HIGH QUALITY MATERIAL -Stainless steel, allergy free, anti-rust, anti-tarnishing, scratch-resistant.Nickel and lead free.Never fade or turn your skin green. 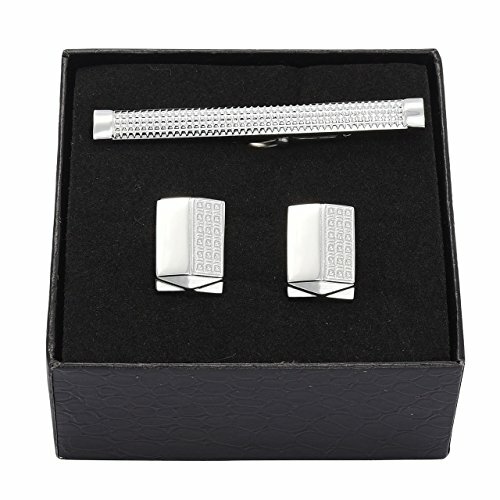 GREAT MEN'S GIFT: 1 tie clip and 1 pair of cufflinks neatly in one box , Graceful Design, Various Selection; For anniversary, birthday, father's day, valentine's day, wedding, graduation, congratulations for men, christmas; For the men you love , For the occasion you value. 100% SATISFACTION GUARANTEED - If you are not absolutely happy with your purchase for any reason, simply send it back for a full refund. No questions asked!